Bright, renovated apartment with finishes and materials of the highest quality for sale next to Passeig de Gràcia, Barcelona. This spacious apartment, renovated and ready to move into, enjoys a magnificent layout, exquisite furnishings and is brimming with natural light. 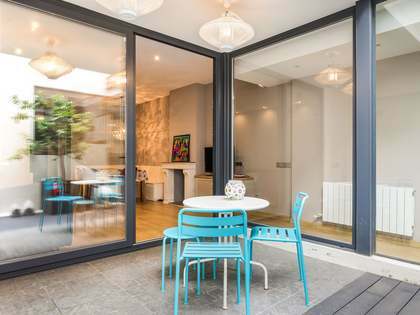 However, its greatest advantage is undoubtably the location, next to Passeig de Gràcia, the nerve centre of the Eixample and one of the most exclusive areas in the city of Barcelona. With few similar properties available in this area it is an opportunity not to be missed. The apartment is located in a renovated rationalist building dating back to 1900, with stately architecture and a lift and concierge. A few meters away there is a garage where parking spaces are always available. We access this apartment, measuring 200m², via an entrance hallway that has a large, practical wardrobe area that divides the night from the day area. The night area is quiet, as it overlooks a courtyard and garden. It consists of a master bedroom; a large, open plan 30m² space with built-in wardrobes, a dressing area and a private complete bathroom, which is spacious and boasts high quality finishes. Next to the main bedroom is the children's bedroom, also with large dimensions, with built-in wardrobes and a play area. Both bedrooms have windows onto the garden and courtyard. Along with these two large rooms, we find a large office, which could be used as an additional bedroom. A corridor connects the night to the day area: a few meters from the bedrooms there is a complete bathroom. A little further on, another bathroom (for guests) lies at the centre of the apartment, just off the hall. This area also has an ironing and washing room and a kitchen with two entrances, one from the corridor and another that connects with the living room. This room stands out for its great practicality and Italian signature style, since the owners designed a very complete, practical and usable minimalist kitchen, with well thought out cabinets and furniture. The kitchen can be used as a daily dining room and for gatherings with friends around the comfortable island-central counter. Finally, we find the large living room, a large room with two large windows overlooking the street. It is divided by a practical storage unit that separates the dining room from the living room. The whole house has hot/cold air conditioning ducts and double-glazed windows to ensure comfort throughout the year. In addition, it has wooden floors, built-in wardrobes and tropical Iroko wood flooring of high quality and strength. 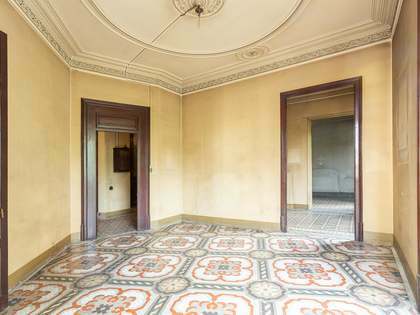 Contact us to visit this unique opportunity for sale next to Passeig de Gràcia. This property is perfectly connected by bus, metro and rail, and even has an Aerobus direct to the airport with a stop just a few minutes away on foot. 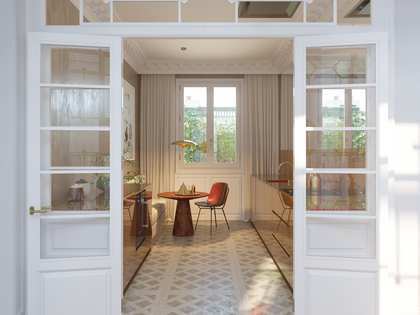 Above all, it stands out for being 3 minutes walk from Passeig de Gràcia and near the most stately part of the Eixample, an area that, despite being luxurious, offers all necessary day-to-day services. Passeig de Gràcia, the most exclusive shopping street in the city, Avinguda Diagonal, the promenades and shops of Rambla Catalunya, El Corte Inglés, Passeig de Sant Joan, the El Born district and Santa Catalina etc. are all close by.